Setting up your brush to perfectly reproduce the desired art style can require a lot of tweaking as well as trial and error. Once you have found the correct settings for your brush, you will want to reuse it throughout your project for consistency. You can do that by creating and using brush presets. Harmony comes preloaded with many brush presets which you can select from the Tool Properties view. 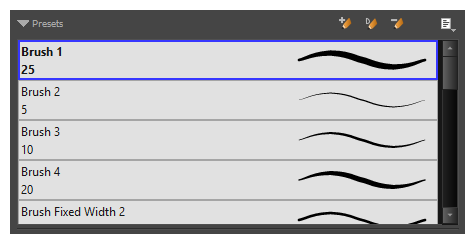 It is also possible to create your own brush presets by configuring your brush, then saving it as a preset. Like brush tips and paper textures, brush presets are saved in your preferences. You can also export your brush presets into an .xml file, and import them on a different workstation, allowing you to share your brush presets between the different people collaborating on your project. NOTEBrush presets are not to be confused with brush tips and paper textures. Brush tips and paper textures are one of the many properties of a brush, whereas a brush preset contains all the properties of a brush. NOTEBrush presets for vector layers and for bitmap layers are separate. A brush preset created while working on a vector layer cannot be used when working on a bitmap layer, and vice versa.